S10 Transfer Case crossmember needed for vehicles with solid axle conversions. 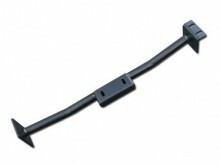 This crossmember provides clearance needed for the front driveshaft. *Important: Check your frame measurement. Inside frame measurement must be 34.92"
Click the button below to add the S10 Transfer Case Cross-Member (Solid Axle Conversion) to your wish list.